If so, then I wish strong arms for everybody in 2015 to wrestle those challenges and grab those opportunities real tight! Well the year is almost over and I'm glad the deliveries of December have all been done. 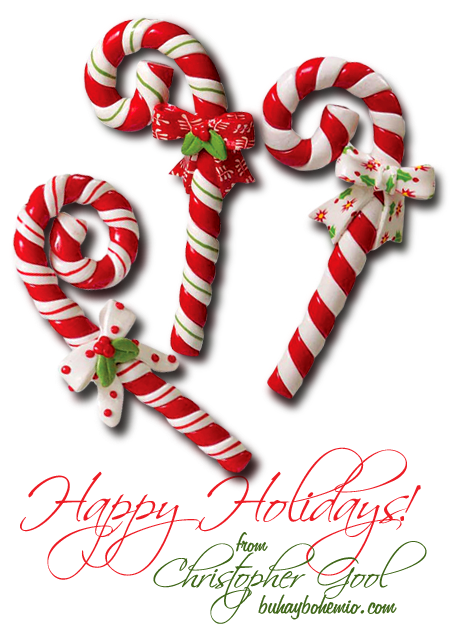 I was still able to enjoy Christmas with family and close friends, and it looks like I'll also be celebrating a stress-free New Year's Eve. I'd say that this year's holiday season is busier than of the past 3 years. Mainly because I have monogram projects now, aside from the usual digital paintings and shirts. 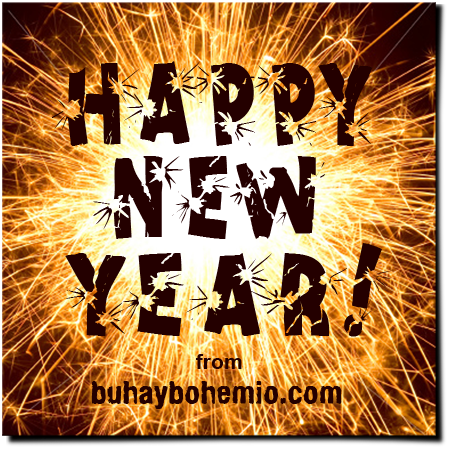 Do you know how many BuhayBohemio Shirts I've sold this holiday season? Only 12 LOL. These are for a friend who's also a regular customer. Ordered in mid November but I only got to deliver them 3 days before Christmas. 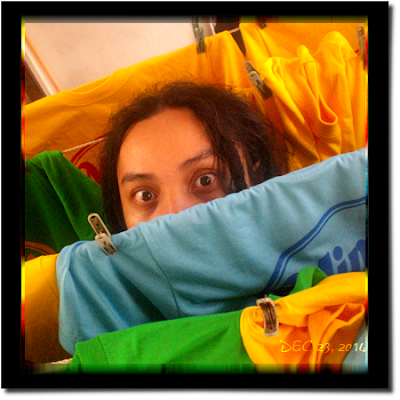 Because I was so busy working on monograms for Customized Chic, I didn't have the time to market my shirts. Well I thought I couldn't accommodate shirt orders anyway. 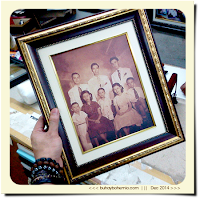 At that time portrait orders are waiting to be done. 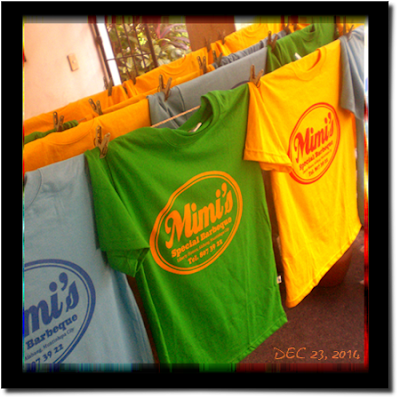 I usually don't accept orders of customized screen-printed shirts nowadays especially if the quantity is too few to outsource. But I just couldn't decline this one by our neighbor who runs a small barbecue business - because their family has been really nice to us! Luckily it's just 20 pieces with a single-color print. She ordered them in November but I only got work on them 21st of December. I remember printing these shirts on the daytime then work on portraits at night until 2 AM! 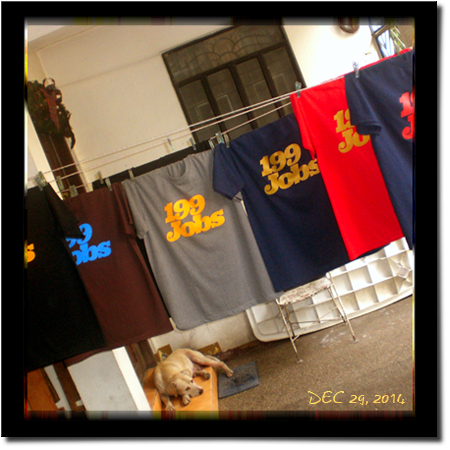 And the last order of shirts for 2014 are these 199Jobs shirts for my friend Fitz. Ordered 2 days before the delivery date. Well it's no sweat because it's just 7 pieces and the stencil is on standby and ready to use. This is actually the 3rd batch of 199Jobs shirt prints. 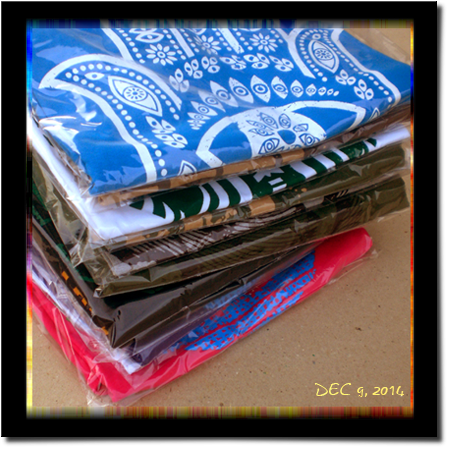 The first 2 batches were printed September and December last year. By the way, are you a freelancer too? Check out 199jobs.com. There might be a service you can offer for Php 199. 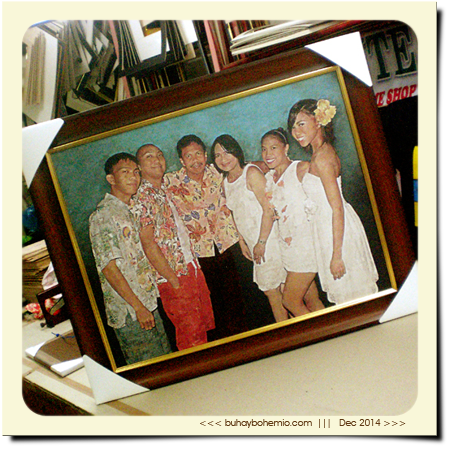 After Customized Chic made a cut-off for holiday orders, on the first week of December, I finally got to concentrate on making these digital portraits. I meant "concentrate" as having most of my waking time spent on these images. 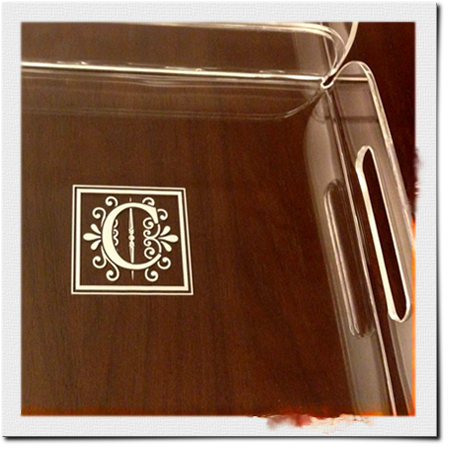 I still had to work on a few monogrammed stamps and trays and even printed shirts on the side. Yeah, this has got to be my most hectic holiday ever. Deadlines were tight so I went cramming! 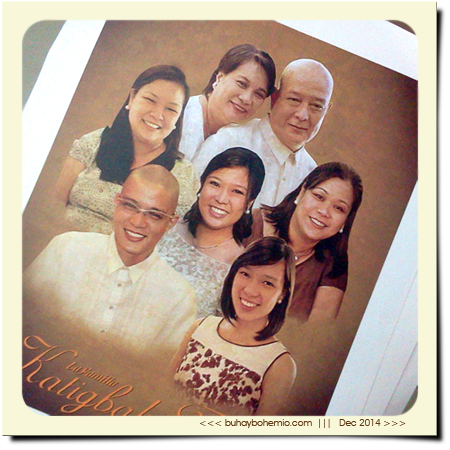 Eight of the portraits must be delivered before Christmas Eve so I had to brave Manila's pre-Christmas traffic to have them printed and delivered on the 23rd. There was no time left for contingency. Despite the circumstance of wrong print sizes and unavailability of the preferred matte canvas, I was able to deliver the goods right on schedule. 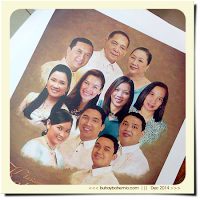 So anyway, I made a total of 16 artworks and most are family portraits - that's 89 faces all in all. (I still have a couple of portraits pending for January.) 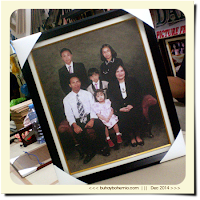 A few of the portraits were ordered with frame and it really gives me such delight to see my work as a finished product. Very inspiring! I really wish I could start working on a new official website for this creative service of mine. How fast time flies! You probably hear that line a lot when December steps in. And it feels even faster than it really is when you're busy. I bet everybody's busy this month. Especially my fellow freelancing artists out there. The closer the holidays come, the busier we get. That's something I learned to accept after 3 years of being self-employed. 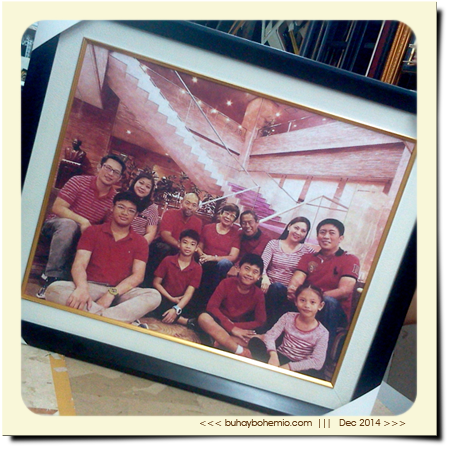 So what has been keeping me busy since mid September that I had to put some stuff for Buhay Bohemio aside? Well it's these monogrammed items for Customized Chic. 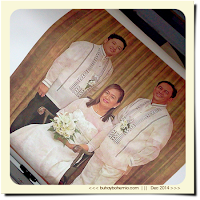 One of my best clients on digital portrait paintings, Madam Yssa, is very much into personalizing things for her home and one day, obviously not so long ago, decided to make a business out of it. 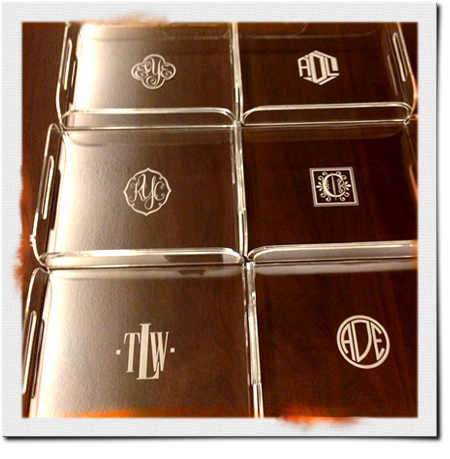 She started with these really sleek acrylic trays with engraved monograms. I also designed 14 graphic prints for her acrylic trays, based on the themes she has chosen for her Prima Collecione. Like this Greek tray (top) and this other one we call Willow (above). Nice huh? Imagine your initials on them. 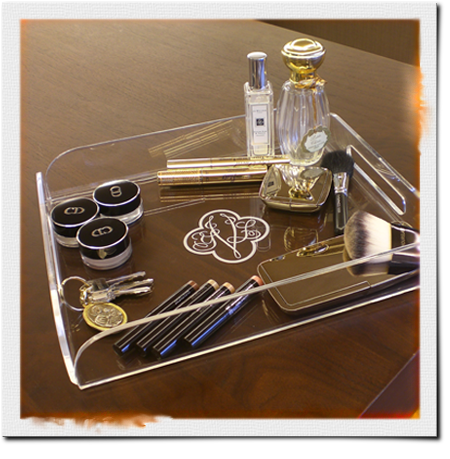 The trays are available in 6 sizes. 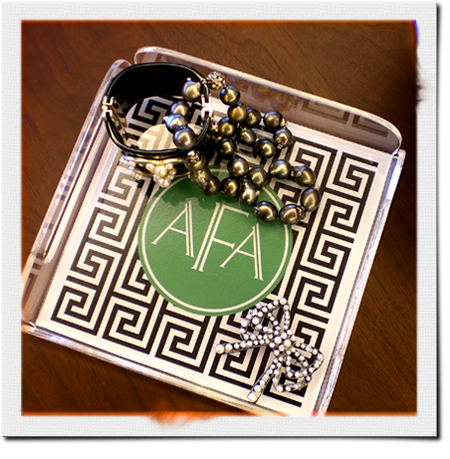 She also has hinged acrylic boxes available that can either have a print or an engraving. 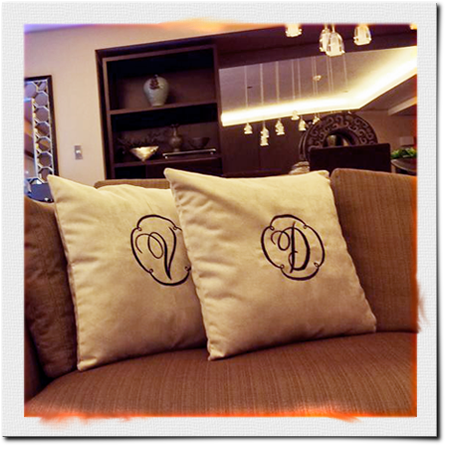 Recently she added throw pillows with embroidered monograms to her product line. We'll be working on pillows with vinyl monogram prints soon. 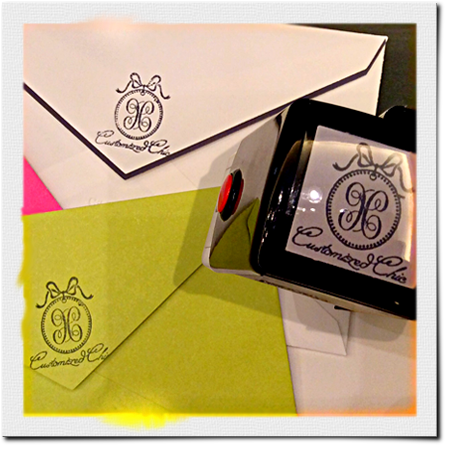 Her latest product is the custom self-inking monogram stamp. 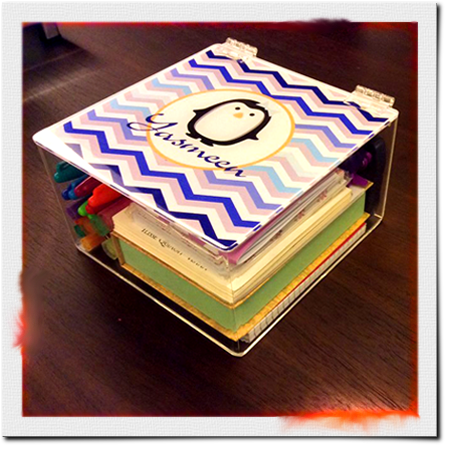 You can personalize your stationery in an instant with these things! So yeah, I am the artist behind every monogram on her products. My collection of fonts in my PC was certainly put into use. Designing her items was so reminiscent of my employment years in export companies where I designed housewares and decor. Really I was almost like her employee for 2 months! Like an artist-on-call, I was confined to my PC, waiting for her instructions, submitting product studies and marketing images to her via email. That of course went on when she started accepting orders. She had fairly a lot of orders for starters, and it was all monograms for me for days and days. I'm beginning to dream of the alphabet in my sleep. She promised to herself that she'll stop accepting orders for the holidays by November 22nd because she's also aware that I also have my own brand to attend to. But there are still a few follow-up orders that she just can't refuse hehe. Well at least the load is not as hectic as the weeks before. Now I could get back to my pending t-shirt and digital portrait orders. You know, in the local scene, there are a lot of personalize-it shops out there, but very few specializing on monogrammed items. 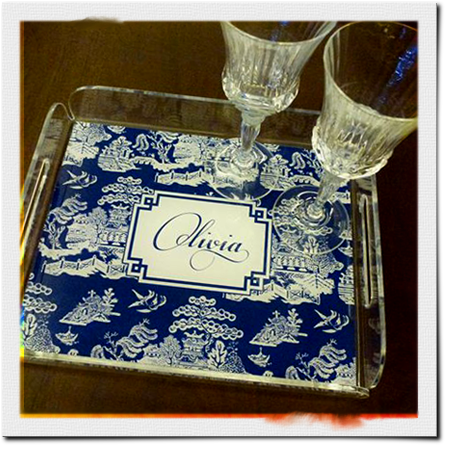 So far she's the only one who offers monogrammed graphic acrylic trays and embroidered pillows. She's getting a lot of positive feedback and I'm really glad I was able to help a client with her business start-up.